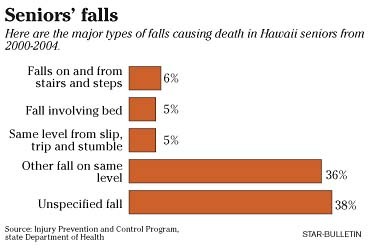 Injuries from falls -- a leading cause of hospitalizations and deaths of seniors -- can be prevented with environmental changes and training on how to fall safely, health officials say. "A big problem is the home itself or the furnishings -- low chairs impossible to get out of," said Rosemary Bakker, gerontologist, certified interior designer and research associate in gerontologic design and medicine at Weill Medical College of Cornell University. Bakker addressed more than 300 participants at a statewide conference, "Reducing Falls by Design," sponsored by the state Health Department on Tuesday at the Pacific Beach Hotel. Falls were the leading cause of hospitalization for injuries to seniors (79 percent) in 2000-2004 and the leading cause of fatal injuries (36 percent), according to a state Health Department study. It lists 2,640 hospitalizations for falls among seniors in 2000-2003. An average of 60 deaths occurred each year among seniors from falls, said Dr. Linda Rosen, deputy director for health resources administration. Falls are inevitable, said Max Vercruyssen, educator and scientist who specializes in ergonomics and human functional fitness, addressing the conferees. But "there are too many fatalities and injuries from falls that could have been prevented by the training of safe falling habits, skills and maneuvers." Training for falls is not emphasized in physical education curricula or in most national and international fall prevention programs, he said. Programs for seniors such as home safety monitoring, exercise, balance and skills building, plus medication management are effective in reducing falls and serious injuries, said Vercruyssen, founder of the Hawaii Academy, a private school for lifetime fitness. Bakker also cited exercise, review of medicines, education and training, and assistive devices to reduce risks of falls, as well as design and safety features. She said she was suddenly confronted with the problems 15 years ago when her mother fell and broke her hip, spent two weeks in the hospital and had to be carried upstairs to her three-story home. "Overnight, our lives turned into a bit of a crisis," she said. Housing and furnishings are designed for healthy adults, not seniors with chronic conditions, Bakker said. But minor repairs and assistive devices can make major differences to aging people, and "there is a big push now to build homes for an aging society," she said. She said England and Wales adopted national regulations in 1999 requiring safety features in all new single-family homes, such as no stairs into the house, a half-bath on the main floor, wide halls and doorways and easily reachable switches and electrical outlets. A few places in the United States, such as Arizona and Texas, also are changing building regulations to provide safer homes for aging citizens, she said. Bakker offered many suggestions to reduce risks of falls in the home, such as removing area carpets that a person could trip over. Residents can find help on her Gerontologic Environmental Modifications Web site, Cornellaging.org/gem. An assessment tool can be accessed that identifies problems in each room and presents solutions.